Vacuum quicker with our cordless backpack vacuum. Daytime clean with peace of mind knowing you have the quietest, most powerful backpack vacuum on the market. Experience the freedom, safety and productivity of going cordless. 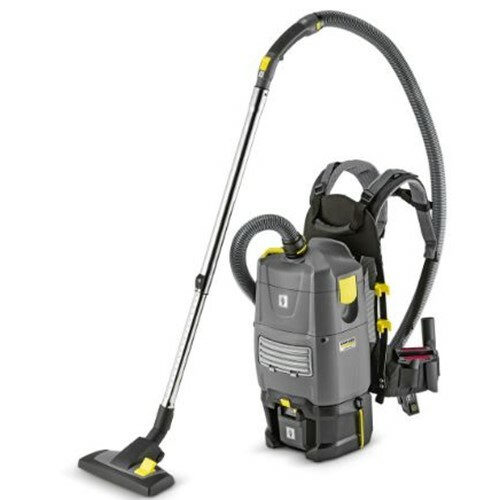 The BV 5/1 Bp backpack vacuum is 100% powered by its lithium-ion battery leaving the operator to move around uninhibited. Our superior technology produces a powerful, yet quiet vacuum that increases your productivity exponentially. It is the quietest backpack vacuum on the market, only emitting 55 dBA. Expect 100 percent of the performance that you get from a traditional backpack vacuum. Operator ergonomics and speed are improved since no searching or bending is needed for the constant plugging and unplugging of the cord that comes with traditional units. Safety is dramatically increased without a cord. Trip and falls are eliminated by removing this potential hazard.